This CellML model runs in both OpenCell and COR to reproduce the published output (figure 4, but using parameters for figure 5 i.e. beta = 1.0 instead of 0.5). The units have been checked and they are consistent. ABSTRACT: Intracellular Ca2+ oscillations are commonly observed in a large number of cell types in response to stimulation by an extracellular agonist. In most cell types the mechanism of regular spiking is well understood and models based on Ca2+-induced Ca2+ release (CICR) can account for many experimental observations. However, cells do not always exhibit simple Ca2+ oscillations. In response to given agonists, some cells show more complex behaviour in the form of bursting, i.e. trains of Ca2+ spikes separated by silent phases. Here we develop several theoretical models, based on physiologically plausible assumptions, that could account for complex intracellular Ca2+ oscillations. The models are all based on one- or two-pool models based on CICR. 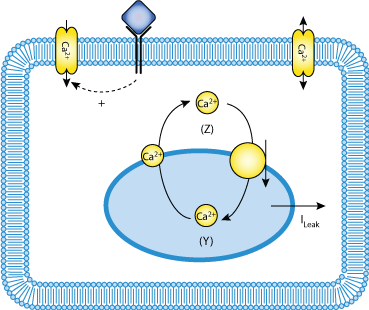 We extend these models by (i) considering the inhibition of the Ca2+-release channel on a unique intracellular store at high cytosolic Ca2+ concentrations, (ii) taking into account the Ca2+-activated degradation of inositol 1,4,5-trisphosphate (IP3), or (iii) considering explicitly the evolution of the Ca2+ concentration in two different pools, one sensitive and the other one insensitive to IP3. Besides simple periodic oscillations, these three models can all account for more complex oscillatory behaviour in the form of bursting. Moreover, the model that takes the kinetics of IP3 into account shows chaotic behaviour. Schematic representation of the one-pool model for Ca2+ oscillations based on CICR. Derived from workspace Borghans 1997 at changeset 4b4ee94cb1a3.